I have sent the developers of Font Explorer X a request to develop plugins for Affinity Designer, Photo and Publisher but I need your help if we want to see this happen. 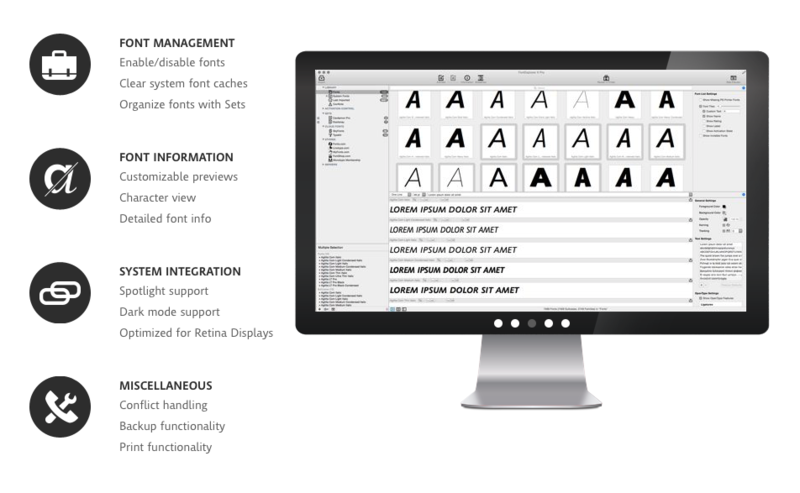 Font Explorer is an application that auto-activates fonts for applications, and is a must have for designers who use hundreds of fonts. Please contact Font Explorer and let them know you are interested in there being a plugin for Affinity products. They have developed plugins for Adobe InDesign, Illustrator and Photoshop and they work really well. However, they will not develop a plugin for Affinity unless we show there is a demand for plugins. any new information on this topic? Yesterday I contacted FontBase and asked if they got any plans for including Affinity products in their range, especially for the auto-activation. They said they have it on their roadmap – so that’s good news! FontBase may be an alternative to be considered. Basic functions are free, but auto-activating and advanced features come with either a subscription model or a one-time-purchase for three machines (Mac/Win) – also I’d say right now it’s way more affordable compared to FontExplorer, though it lacks some comprehensive options. Now the important question that remains is: What are the requirements to get this to work with Affinity products?